If you want to know how cold weather effects driving an electric car, who better to ask than people who live in Saskatchewan? That’s what Erin Petrow, a reporter for the Saskatoon Star Pheonix, did recently. She interviewed local residents Jason Cruickshank, who owns a Chevy Volt, and Pat Keyser, who owns a Tesla Model S, about their winter driving experiences. Keyser pointed out that the battery in her Model S is far more reliable than the puny little 12 volt battery found in most conventional vehicles. While it loses some energy in the cold, it doesn’t have a big lump of an internal combustion engine to start in the morning after sitting in sub-freezing temperatures all night. Asking a starter motor to make a crankshaft carve canyons through gelid lubricating oil takes a lot of power. Keyser admits that part is true. 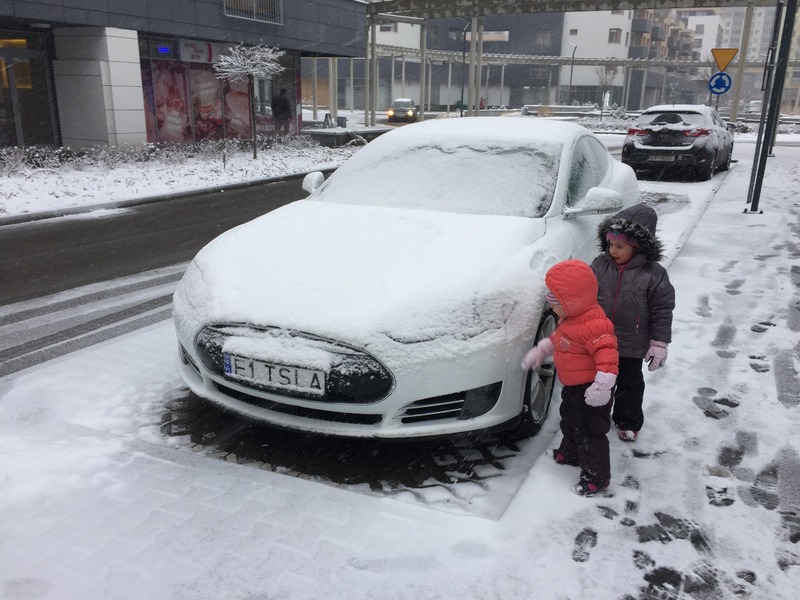 The range of her Model S is about 25% less in cold weather according to her observations. But she points out that conventional vehicles also don’t go as far on a gallon of gasoline in winter. Not only do they use more fuel when idling to keep car heaters working, oil companies use a different blend of gasoline in cold climates, one that uses a higher proportion of aromatics that ignite more easily for better cold starting. But those lighter components also have less energy available when burned, lowering fuel economy by about 10% on average. Keyser says she has to be more aware of the reduced range in winter and plan ahead for where she will recharge her car on trips. But she doesn’t mind. Those stops give her a chance to discover different communities that she would never have stopped at otherwise. Both Keyser and Cruickshank agree that the number of EV chargers in their area needs to increase. Keyser says it is just part of being an electric car pioneer. “When motorized vehicles first came along, there weren’t gas stations everywhere,” Keyser says. Cruickshank adds that even on most trips, it is not necessary to wait for a full battery charge. All that is need is enough added range to get home or to the next destination where the car can be plugged in and left to recharge while the driver is busy doing other things like shopping or visiting family and friends. Usually, charging away from home is more a matter of topping up to avoid range anxiety. And the infrastructure is getting better all the time, even in Saskatchewan where fast chargers that can deliver an 80% state of charge for most electric cars in 45 minutes or less. Despite some drawbacks in cold climates, electric cars still have much lower operating costs than conventional cars. Plugndrive.ca estimates it costs Keyser $579 to drive her Model S 20,000 kilometers. It would cost $2,490 for the gasoline needed to drive a conventional car that far. The Chevy Volt would need only $490 worth of electricity to cover the same distance but would need to use some gasoline along the way. Here’s an interesting point from Plugndrive: In Saskatchewan, the majority of electricity comes from burning coal. That means the electricity needed to run Keyser’s Tesla for 20,000 kilometers would create 2,495 kg of carbon dioxide. The electricity needed to power Cruickshank’s Chevy Volt the same distance would create only 2,160 kg of carbon dioxide. In Manitoba or Ontario, provinces that get most of their electricity from hydroelectric sources, the carbon emissions from driving 20,000 kilometers would be less than 40 kg. How does that stack up to a conventional car? Plugndrive says a typical gasoline powered car would create 4,880 kg of carbon dioxide while driving 20,000 kilometers, more than 12 times as much as an electric car. Electric cars don’t travel as far in cold weather and they take longer to charge. Those are factors that any EV driver should take into account, but they shouldn’t stop anyone from buying an electric car. If Pat Keyser can drive a Tesla Model S in the winter is Saskatoon, no one with an electric car should fear the ravages of winter.